One of the joys of managing is supporting the development of your team members. One of the challenges of managing is navigating the many mistakes your employees make over time. And while the mistakes are potentially aggravating, your response to the mistakes serves as a powerful learning opportunity for your team members. 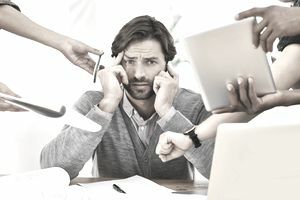 This article outlines seven of the most common employee mistakes and offers guidance for the best way for managers to deal with them in a constructive manner. Effective managers are masters at delivering feedback—both the constructive or negative type as well as everyone’s favorite, positive feedback. Remember, feedback is all about either reinforcing positive behaviors that support business, team, or personal success, or, remedying or eliminating those behaviors that detract from performance. In every situation described in this article, you will draw upon your feedback skills to create a constructive opportunity for learning and development. 1. Asking, “What Should I Do?” Many employees are uncomfortable taking risks or doing something in a manner that disappoints or angers the manager. If you feed this habit by providing direction, you will become a key part of the reason why your workers do not perceive they are empowered to take action and fix problems or make decisions. The Solution: Respond to the “What should I do?” inquiry with the very simple, straightforward, “I’m not certain. What do you think you should do?” Let the employee think about and proffer an answer. If it is in the neighborhood of correct, offer, “That’s a good idea. Why don’t you try it.” Of course, if it is not quite right, instead of telling them what to do, ask questions that encourage them to think critically. Consistent use of this technique will support employee development and improve feelings of empowerment and engagement. 2. Not Communicating With You at the Right Level of Detail. Employees err in one of two directions on this issue. They either share too much with you or not enough. The former is annoying and the latter potentially damaging to your credibility if you are caught unaware of key issues. The Solution: Educate new employees on your communication preferences for detail. If you enjoy looking at the entire picture, encourage your employees to provide detailed briefings and reports. If you prefer just the top-level details and key points, offer them some examples and for the first few updates or reports, sit down with them and provide specific feedback. Helping your employees understand how to communicate with the right level of detail will strengthen your ability to do your job and eliminate the guessing on the part of the employee. 3. Not Communicating With the Right Frequency. Much like the “level of detail” described above, every manager has a preference for communication frequency with subordinates. Some managers prefer daily communication and status updates. Others prefer to engage periodically for status updates, but daily communication is not required. The Solution: You owe it to your employees to highlight your communication protocol. Let them understand your style and needs and offer positive reinforcement as they adapt their habits to meet your needs. Of course, as a manager, you have the responsibility to also understand their preferences and flex to adapt to their style for your own interactions with your employees. Also, remember to highlight to your employees that for emergencies and big problems, all bets are off and to communicate with you immediately. Cultivating an effective communication routine with your employees will help them structure their own work and operate with the assurance that they are properly supporting you. 4. Not Sharing Bad News With You. If you’ve ever been caught by surprise about a problem one of your employees was involved in or knew about, you understand how aggravating this issue. Your tendency may be to display some combination of anger and frustration. Instead, bite your tongue and follow the solution described here. The Solution: Draw upon your feedback skills and remind yourself that when tempers are hot or the situation is emotionally charged, you should have a cooling-off period before delivering feedback. Once you’ve calmed down, open your discussion with an unemotional description of how not sharing the bad news impeded your ability to help solve the problem and do your job. Indicate that you were upset about being caught unaware and that this was a mistake that cannot happen again. There’s no need to dig into why the employee held off on informing you. Simply reinforce that it is critically important for him/her to involve you in future situations. Ask if they understand and then end the discussion and move forward. The willingness to share bad news with the boss is a function of trust. It is possible your employee assumed that you would be angry and that the news might jeopardize their employment or at least your evaluation of them. You must reinforce that it is both expected and safe for people to share bad news with you. Just remember to not metaphorically shoot the messenger. 5. Gossiping. It’s nearly impossible to eliminate dialog about issues and people in the workplace. However, we all know that gossip is potentially misleading and even malicious. If you observe employees gossiping, it offers an opportunity for you to reinforce positive core values. The Solution: Go out of your way to share with your team members the destructive potential of gossip. Reinforce that the subject of gossip is always at a disadvantage and that the individuals engaging in and spreading gossip are risking damage to their own reputations. Reinforce the need for people to ignore gossip. Encourage them instead to seek people out and ask questions if they have workplace issues or concerns. Open, honest dialog is better than questionable allegations raised behind someone’s back. Your work in eliminating gossip will pay dividends in the form of a healthy workplace where individuals feel respected at all times. 6. Not Finishing Projects. One manager described this as the “70-Percent Effect,” where an employee would start but never finish major initiatives. “He would get most of the way there, but never quite finish,” was the manager’s complaint. The Solution: Reinforcing a culture of accountability for results is critical to your success. Teach employees to use proper project management techniques, including identifying their completion and delivery dates. While dates sometimes slip, it is incumbent upon you to ensure your employee keeps his/her word and brings every project to closure. Too many lingering projects drains resources and management attention. If you are struggling with a “70-Percenter,” redouble your efforts to observe, coach, and as needed take action. Just as your employees expect 100-percent from you as the manager, you expect the same from them. 7. Not Cooperating With Coworkers. If you’re not careful, you can end up serving as the referee for your employees. It is not uncommon in close quarters for employees to disagree. However, when they begin pleading with you to resolve their communication issues, it is time to take a different form of action. The Solution: Meet individually and then as a group to review their communication challenges. Again, drawing upon your best feedback skills, describe in specific detail how this behavior detracts from workplace performance and success. Amplify that it detracts from their own performance. Offer to provide training on conducting difficult discussions. Observe the parties in action and offer ample coaching and feedback. Teaching your team members to conduct difficult discussions strengthens the opportunity for high performance to emerge and minimizes your need to serve as a referee. Instead of taking sides, train and yes, force the individuals to resolve their own issues. Navigating the employee problems and mistakes is simply a part of your role as manager. Always view the problems as opportunities to teach, train, coach, and improve performance. Your positive approach to these often frustrating activities will set a powerful example for everyone on your team.